We can age the following species whitetail deer, mule deer, blacktail deer, pronghorn antelope, caribou, moose, elk, sheep, red deer, Rusa Deer, Axis deer, Fallow deer, cougars, bears, bobcats, sika deer, coues deer, wolves. (please note the tooth required for aging carnivores is the upper premolar located directly behind the K9 tooth). If it has teeth we can age it! When your results are ready you will receive an email with a pdf form that you can then print out. If you ordered a certificate it will arrive by mail within two weeks of receiving your results. Most of all, you should expect from us that we live up to our commitment to provide great customer service and the highest quality analysis. Customer Service and Quality of Analysis Really are our Priority and Passion. 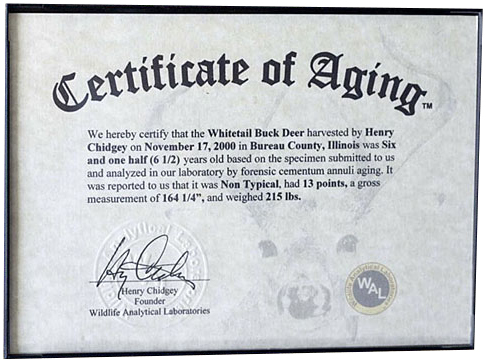 Frankly, we get as excited as you do about your successful harvest of an old, wise, mature deer.